Preserving and canning can seem intimidating at first, but they can be an easy way to save money and give fruits and veggies a longer shelf life. 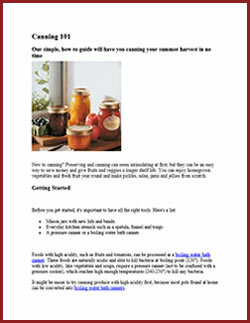 You can enjoy homegrown vegetables and fresh fruit year-round and make pickles, salsa, jams and jellies from scratch. Mason jars with new lids and bands. Everyday kitchen utensils such as a spatula, funnel and tongs. A pressure canner or a boiling water bath canner. Foods with high acidity, such as fruits and tomatoes, can be processed in a boiling water bath canner. These foods are naturally acidic and able to kill bacteria at boiling point (120°). Foods with low acidity, like vegetables and soups, require a pressure canner (not to be confused with a pressure cooker), which reaches high enough temperatures (240-250°) to kill any bacteria. 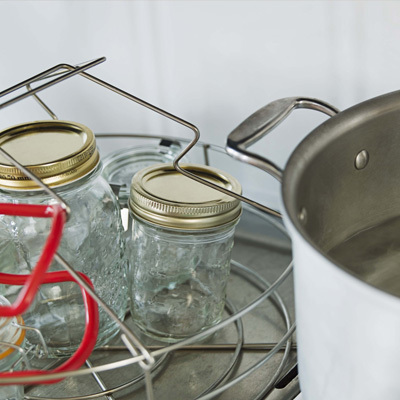 It might be easier to try canning produce with high acidity first, because most pots found at home can be converted into boiling water bath canners. Remove jars from canner and let sit 12-24 hours. Don’t re-tighten or adjust the bands. Use Mason jars to preserve foods, but never re-use the lids. Canned food should only be kept up to a year. Only can the amount of food your family will consume over the span of a year.